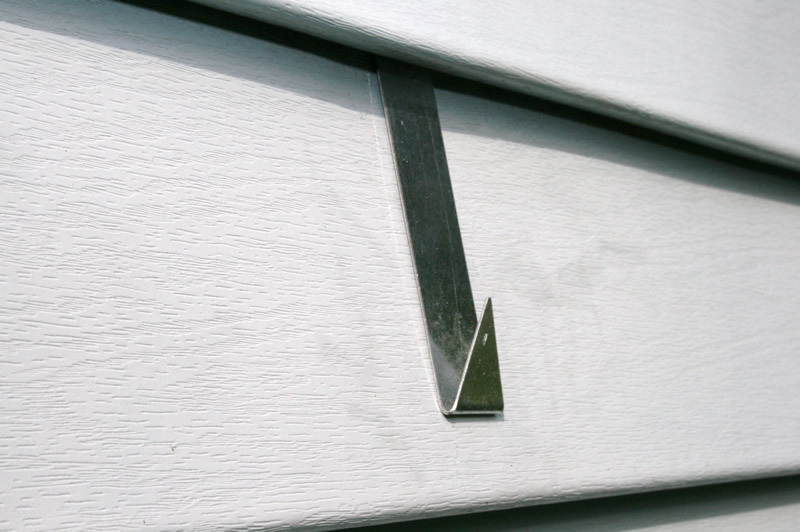 Hang your metal barn stars and decorative items on your vinyl siding without using any tools, screws, nails, bolts, drilling, hammering, hanging anchors, or using adhesives! These Amish handmade galvanized siding house hook hangers are designed to simply slide under your vinyl siding to hold your metal stars and other items such as address and name plaques, seasonal and holiday decorations. Our house siding hooks are made from galvanized metal to reduce rust that may tend to discolor your siding over time. The decorative hanger simply slides between the siding and hangs on the rear lip. You can also re-position or remove them easily at any time without damage. Each siding hook holds up to 15 lbs. Please Note: These hangers will hold all of our Amish barn stars up to the 53" stars. They are NOT recommended for 72" metal stars.